Miami Club Casino is one of the outstanding US friendly casino which works well with Samsung Android smartphone. This online casino uses the award winning WGS casino software and was established in 2013 and it is operated by Deckmedia N.V., which owns numerous online casino properties and boasts vast experience in the gaming business. When you will enter the Miami Club Casino online with your Samsung Galaxy smartphone or any other Android you can feel the distinctive and stylish look that fits perfectly with the high-life theme. 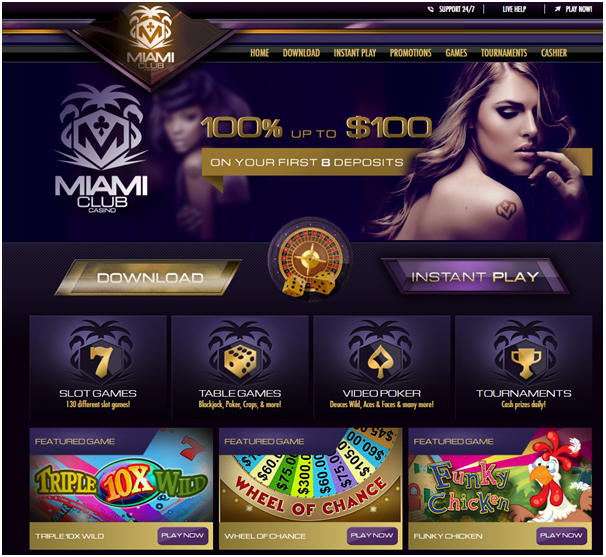 Deep purples and black, bathed in gold, give the website an exclusive feel that easily sets it apart from other casinos, and the promise of an USD800 welcome bonus plus rich tournaments make signing up to Miami Club even more desirable. The casino offers both free and real money play for all of its players, and it is clear that plenty of effort was put in the selection of games and additional features, including tournaments and their loyalty program. 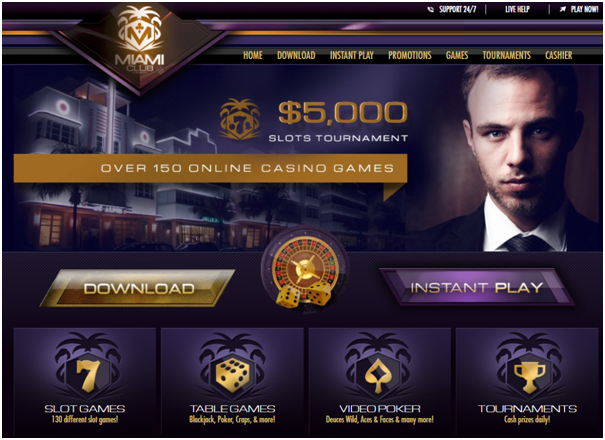 As the casino is powered by WGS Technology, there are a fantastic range of slots, table games, video poker and tournaments that you can try instantly online or on the Miami Club Casino mobile offering, or by downloading the desktop application. 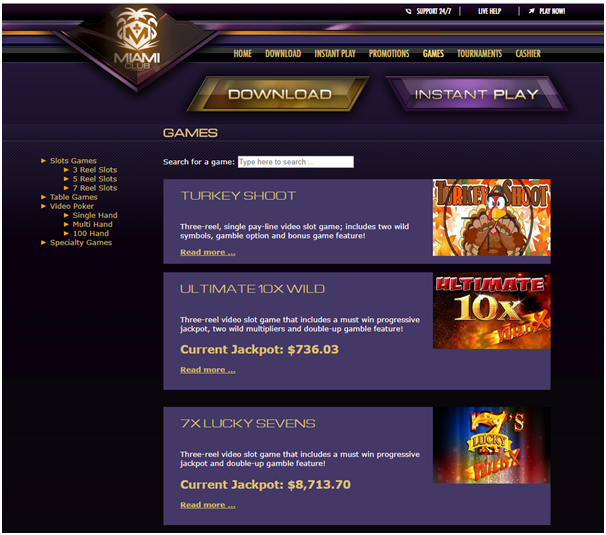 In total there are over 150 casino games to choose from. Miami Club Casino offer daily, weekly and monthly tournaments featuring slots, video poker and Blackjack games. 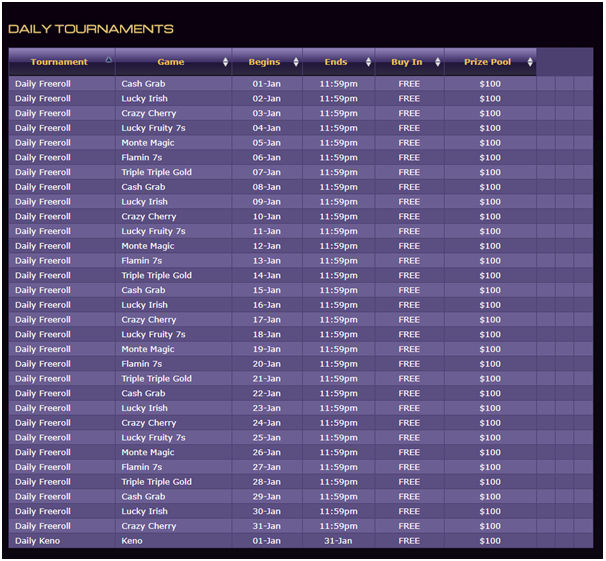 All you need is to click on the Tournaments link in the casino lobby to see which games are currently being offered, make your pick and sign up by clicking the ‘Register’ button. Your entry fee awards you funds to play in the tournament, once you’re entered and the game has loaded you will see your funds balance in the left hand corner of the game. You will also see the number of bets you need to make to qualify for the tournament (Usually it’s just one) and, once you’ve made your qualifying bet, you’ll also see your ranking, the total number of wagers you’ve made in the tournament and how long the tournament has to run before it ends. Note that the tournaments end promptly at the published time. Any hands, spins or bonus features in play at the point at which the tournament ends will not complete and the outcome will not apply to the final result of the event. Only completed hands, spins and bonus features will count towards the final outcome. Tournament prizes that are paid in cash are paid directly into your Real Account. They can be withdrawn at any time. Tournament prizes that are paid in the form of bonus credits are not subject to any wagering requirements. Tournament prizes that are claimed by players who have not purchased credits at Miami Club will be regarded as non-deposit bonuses and will be subject to the standard non-deposit bonus terms and conditions. Also just bookmark this link on your device for instant up to date access at any time. 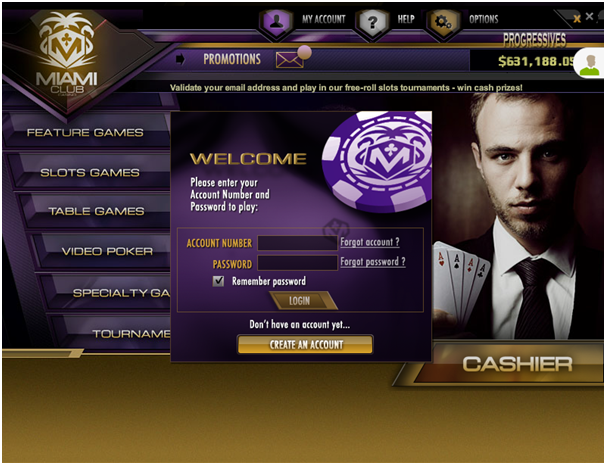 As a new player you are awarded up to $800 in bonuses when you open your account at Miami Club online casino. Then the casino will match each and any of your first deposits as online casino credits, 100%, up to $100 every time on your first eight deposits. Just you need to click on the ‘Cashier’ button in the version of the casino software that you choose to use like mobile, online Instant Play or Download), register your account and then click the button marked Cashier. Choose the deposit method you wish to use, Credit Card, Neteller, Skrill, BitCoin or any of the other available options and follow the instructions on the screen. Once you have finalized the transaction you will be presented with radio button options for the bonus offers that are available. Choose the ‘Welcome Bonus’ option, once your payment is processed, the bonus will be immediately added to your account along with your casino credits. Remember that all bonuses at Miami Club have a minimum play-through requirement associated with them. Referred to as the ‘Wagering Requirement’ this is the minimum that you will need to wager after receiving a bonus before you will be permitted to withdraw any winnings from the casino. You can review the Wagering Requirement associated with any bonus in the cashier before you accept it. The Wagering Requirement is a multiple of the Bonus amount plus any associated deposit. Also at Miami Club, every wager you place, on any game, earns you comp points in your account. The more you play, the more comp points you earn. Comp points can be redeemed for bonus credits, those credits can then be wagered to earn even more comp points! Redeem your comp points by clicking on the ‘Rewards’ link at the top of the screen in the casino cashier and note that the minimum redemption is 2,000 points ($2.00). 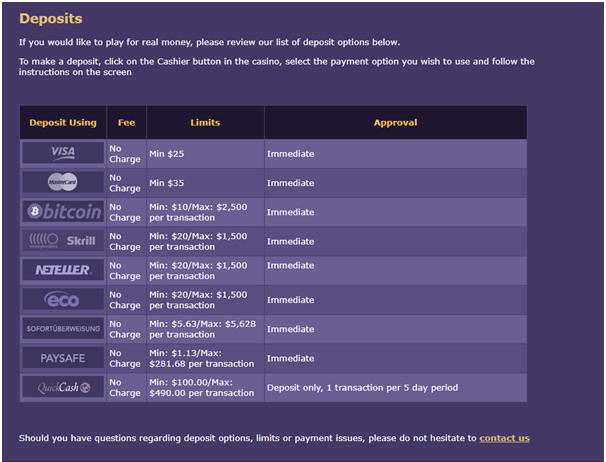 There are various deposits and withdrawal options at Miami Club Casino. All transactions are encrypted with the latest technology providing the highest standards of security. The deposit methods available include: Visa and MasterCard credit cards, Bitcoins and e-wallets, including: Skrill (Moneybookers), Neteller, Eco, QuickCash, Ukash, Sofort, and Paysafe. All transactions made on Miami Club are made using US Dollars and you can make real money deposits by clicking the “Cashier” button, choose the payment method they prefer and follow the instructions that appear on their screen. You can fund your casino account with a minimum transfer limit of just $1.13 up to a maximum of $3,000 per transaction depending on the mode of payment you choose. No charges apply when making a deposit, and in most cases the transfer is processed instantly. To withdraw winnings, you simply have to click on the “Withdrawal” button in the cashier, choose their preferred withdrawal method, type in the amount they wish to cash out and follow the on-screen instructions. The withdrawal methods to choose from, include Bitcoins, e-wallets Neteller, Eco and Skrill (Moneybookers) which allow you to cash out $150 to $2,000 per week at no extra charges; check payout up to $2,000 per week that is courier-delivered for a fee of $30; or by wire transfer, which lets you cash out up to $2,500 per week for a fee of $60. The time taken for approval of withdrawal requests ranges from approximately two business days for e-wallets, to up to 10 business days for requests made by wire transfer. Note that their payout department operates from Monday to Friday. If you have any questions or concerns about playing at Miami Club Casino that you would like to discuss with a representative, you can easily get in touch with the multilingual customer support team 24/7 via live chat. Alternatively, you can call the support team using the toll-free number 1-888-492-9311, or their regular number 1-657-208-5476. The team can also assist you with any casino-related matters by sending them an email at support@miamiclubcasino.im which includes your account username. ← How to use unlock methods to keep Samsung Galaxy Note 8 safe and secure?